Mixing up my skincare favourites is something I do quite often. Life is too short to only use one moisturiser, and in some ways, I’m worried my skin will become too settled and desensitised by one moisturiser or serum alone. That feeling when you wake up after a night of using a new skincare product for the first time, is often the best. Your skin has lapped up something totally new and exciting and will show you a heap of benefits the next day. Or at least that’s what I find from the skincare products that I have used. The best of which are from the luxurious Chanel skincare line. Whilst some ladies spend money on their hair or their makeup, there are those who love to use up their pennies on amazing skincare. I would probably class myself as someone who is happy to spend money on all three in total honesty, but that’s because I’m an obsessive beauty blogger. But if I had to choose, skincare would win, hands down. Your hair can look great if you put a hat on, or tie it up into a bun; your skin does not get the same luxury. And therefore ensuring it is in the best condition it possibly can be, is something I take rather seriously. 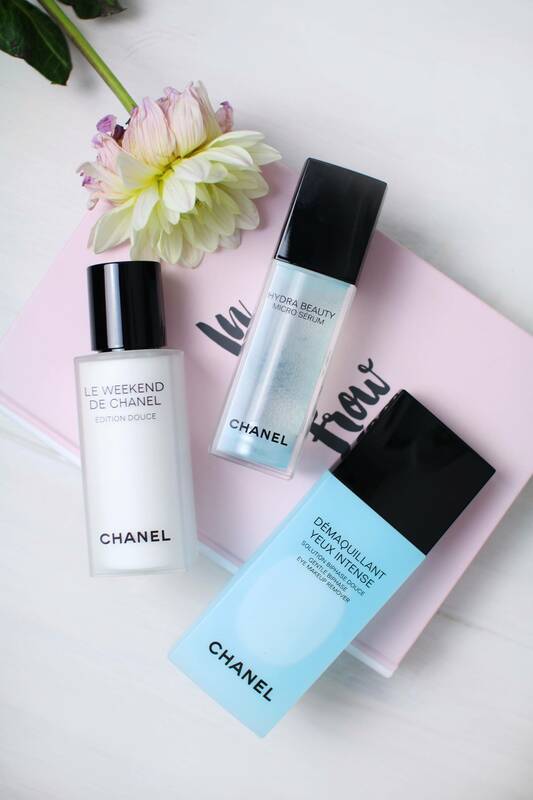 Thus, I wanted to show you three products from the Chanel skincare line that I think you are going to love. The Chanel Hydra Beauty Micro Serum is the product I use during the day. As the first step in my daily routine, I will add a small amount of the product onto my fingertips before massaging into the skin. The consistency is of a liquid gel, that absorbs into the skin within a few seconds. After absorbing the liquid content, the skin has a soft and hydrated texture, almost as though a thin layer of silicone is coating the outer layers and ensuring the hydration is locked inside. It smells beautiful, which perhaps could be the hydrating camellia extract that the product contains, but either way, the smell is not too strong, but definitely apparent. Over the top of this, I will then add my moisturiser, yet this step is certainly not needed as the serum will add wonderful hydration for the day, without needing the added layer. I only add a moisturiser because mine includes brightening and luminising features; and I love me a dewy complexion. Chanel Le Weekend, housed inside a classic matte white and black Chanel bottle, is an evening treatment. It renews the skin overnight by gently exfoliating and hydrating the top layers of skin, renewing and repairing the skin after the week before. This is to be used for two days, and therefore I use this on the weekend as it suggests, just to ensure that I don’t over use it. It is an intensive overnight treatment, and therefore will increase sensitivity to sunlight in the days after using, so bear this in mind. But I love the fact that over the weekend, you can give your skin an intensive moisturise, to brighten and increase luminosity for the next week. The Glycolic acid it contains, gently exfoliates the surface to reveal beautiful skin beneath, that is hydrated and well moisturised. And I certainly notice my skin looks brighter the days after using. I totally fell in love with the whole idea of this product, and then after using it for a few months, it has completely stolen the show. The Chanel Bi-Phase Eye Makeup Remover is the product I probably love the very most. As a waterproof mascara wearer, I am always on the lookout for products that can strip mascara from the lashes without a lot of work. And although this product does not state it is intended for waterproofed eyes, it certainly does the trick. In fact, I feel Chanel should maybe put this on the bottle, as it is a huge bonus for me. On sitting, the liquid within the bottle splits into what I imagine is the oil and water content, which on shaking, turn into a light blue liquid. This oil content is what helps to break down the waterproof mascara and remove it with a wonderful amount of ease, yet, you would not know there is any oil content inside. The product does not feel at all oily, and does not leave an oily film after use, as oil based removers often do. It is the height of luxurious makeup removers, remaining gentle, sensitive and refreshing. I am a big big fan! Have you tried any Chanel Skincare? Can you recommend anything to me that I should try! I am totally hooked on these three, so I would love to know what you swear by!